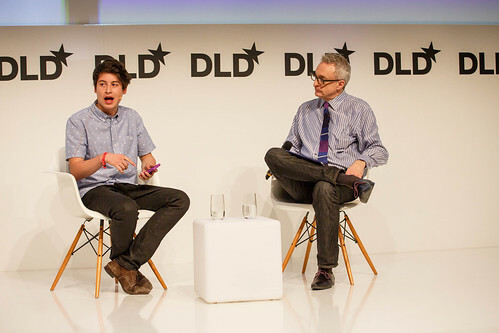 The Australian-born British entrepreneur Nick D'Aloisio is only 18-years old and has already done enough to awe many. 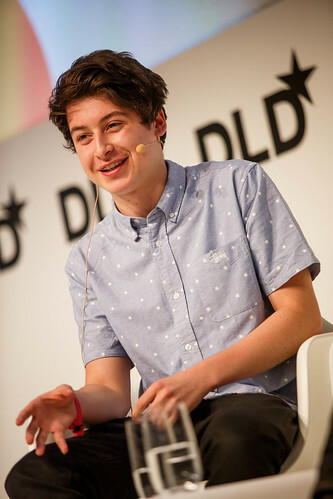 He is rumored to have been the youngest person in the world to have raised venture capitalist funding at age 15, from investors such as Sir Li KaShing, Rupert Murdoch, Ashton Kutcher, Stephen Fry and Yoko Ono. He then founded Summly, an AI company that created a summarization technology and mobile product. He was named 'Innovator of the Year' by the Wall Street Journal in 2013. And recently, in March 2013, he sold Summly to Yahoo, a move aided by his meeting Marissa Mayer at a DLD dinner a couple of year ago. In January of this year, he announced then launch of "Yahoo News Digest" at CES. Downstairs in the Maxsaal at DLD14 D'Aloisio is sitting down with the journalist David Kirkpatrick to talk about spreading idea, content and news.The conversation begins by taking a look at D'Aloisio's personal life, where he juggles being a Yahoo employee and taking school exams. "It's a bit weird but I find the maths I learn at school does actually help at Yahoo," D'Aloisio says. Next they begin to discuss "Yahoo News Digest", news stories synthesized from units of information including image, video and text, with sources listed at the bottom. At the moment, the product is only available in the US. Users get news summaries twice a day. The app is similar to Summly, but while that was purely algorithmic, this new product is checked by an editor. Getting down to the relevance of his products, D'Aloisio speaks of how currently on the Internet, there is a deluge and ephemerality of information. "A news item comes up on Twitter and five seconds later it can be gone," he says. There is no news hierarchy – so the KPI of "Yahoo News Digest" is to inform people through the product in the fastest way possible. "What are your thoughts about where professional media is going?" Kirkpatrick asks. D'Aloisio answers he believes it is an exciting time, because on the one hand there are new products, but there is also still the same need for journalism. "We can't synthesize news out of nothing," he comments, adding that he believes there is an opportunity to further consider adapting news formats to fit new products and preferences. "You've done this by 18. What do you want to do by 25? Or 45?" Kirkpatrick rounds up the discussion. "I want to continue thinking about these ideas," D'Aloisio answers. "And I would love to study philosophy at university." Opening the conversation to the floor an audience member asks whether D'Aloisio's view of young users media is rather optimistic, considering that outlets such as Vice have said young people are not interested in news. Before another journalist comments that D'Aloisio's optimism has given her hope for her profession, D'Aloisio says that his view of news is more traditional, but that Vice too have just opened their news site and he is excited to see how that involves.